Sam Harris-Jones is one of the newest additions to the Employer Engagement team, having recently been appointed internally from the Student Records team. Sam attained the degree of BA (Hons) Criminology at the University of Greenwich, and whilst in his second and third years, he worked as a New Student Mentor ensuring the transition from further education into higher education was as smooth as possible for first year students. 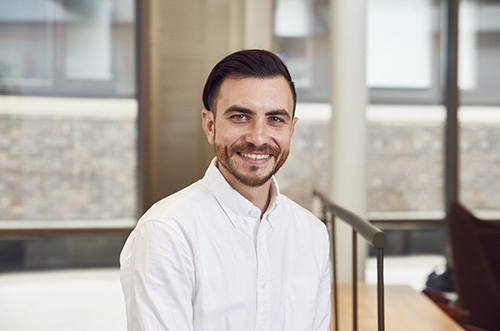 That was the start of Sam’s career in HE and 8 years’ later, Sam’s various roles have spanned across all facets of student journey such as the recruitment of new students, student records involving registration and graduation and employer engagement. Sam’s role within the Employer Engagement team is managing relationships and handling the employer engagement for our Cass Business School. This includes employers working in the financial, accountancy and marketing sectors. He is currently focusing on recruitment for the Banking, Finance and Consultancy Fair where students can engage with employers from multi-national organisation and small to medium enterprises, and those companies are also able to engage with the student population and promote any schemes which are available. In addition to this, Sam is arranging industry insights sessions where students can go through an application processes, and if successful, visit multi-national organisations for a day or half day and really get a feel for the environment and developing the employer-led careers events for Cass. He will also be sourcing exclusive consultancy projects for our final year management students. If you are interested in any of these, then please do get in touch!